We’d love your help. Let us know what’s wrong with this preview of Harriet Wolf's Seventh Book of Wonders by Julianna Baggott. This absorbing novel spans the entire twen A brilliantly crafted saga about three generations of women and their secrets, including the discovery of a final unpublished book by the family matriarch, a revered and reclusive author. To ask other readers questions about Harriet Wolf's Seventh Book of Wonders, please sign up. Near the end of the book, her previous boyfriend leaves a message for her: Sterbe Nicht. What does it mean? Keksisbaby Susan is right. It is german and means Don't die. Was Harriet Wolf a "real person" or is she a fictional character that is the creation of the author, Julianna Baggott? April No, Harriet Wolf is a fictional writer in Julianna Baggott's wonderful novel. I checked Goodreads, just to be sure. "This is how the story goes: I was born dead - or so my mother was told"
Harriet Wolf was a famous novelist and recluse. Her daughter and granddaughters frequently get questioned by her fans about her books. There is a rumor circulating that she has a final manuscript and the public is curious if it really exists. Her daughter, Eleanor just wants to be left alone. She doesn't like answering questions about her Mother's books. But when Eleanor is hospitalized, her daughter Tilton calls her older s "This is how the story goes: I was born dead - or so my mother was told"
Harriet Wolf was a famous novelist and recluse. Her daughter and granddaughters frequently get questioned by her fans about her books. There is a rumor circulating that she has a final manuscript and the public is curious if it really exists. Her daughter, Eleanor just wants to be left alone. She doesn't like answering questions about her Mother's books. But when Eleanor is hospitalized, her daughter Tilton calls her older sister Ruth who comes home. Ruth ran away years ago while and vowed one day to return to save Tilton who has always lived with their over protective Mother. This book is told through each woman's POV. Through each of them, we learn about family secrets, love, Harriet's past, mobsters, the dynamics of dysfunction in a family, and how our own personal stories can affect, shape and define us. A wonderful book about mothers and daughters, their complicated relationships and how easy it is to misunderstand each other. Three generation of women, Harriet, who has died had written a series of six best selling books, there is a rumor that a seventh exists. Professors, scholars and book, aficionados the world over are anxiously waiting for it to surface. Eleanor her daughter who has made many mistakes, holding tight to her daughter Tilton after letting Ruth run away at sixteen. Interesting A wonderful book about mothers and daughters, their complicated relationships and how easy it is to misunderstand each other. Three generation of women, Harriet, who has died had written a series of six best selling books, there is a rumor that a seventh exists. Professors, scholars and book, aficionados the world over are anxiously waiting for it to surface. Eleanor her daughter who has made many mistakes, holding tight to her daughter Tilton after letting Ruth run away at sixteen. Interesting characters all the story is told by each character in alternating chapters. It is Harriet's story that I loved the most, of course her story is from the missing seventh book. Even the side characters are diverse and add much to the story. Some of these characters and places throughout the novel actually existed. I could tell, how much the author loved these characters and it helped me love them too. Flawed for sure but all hoping for something better. Loved Tilton and her unique perspective of the world and her family. By books end I felt as if I had melted and I am very glad I read this book. A story like no other! I must PONDER before reviewing. ---- Pondering now complete. Swirling images reined in, thoughts reasonably forthcoming, having dissected through the chaos - somewhat. "If I'd wanted to be a moralizer, I'd have done so . . . As a novelist, my job is to make things up. As a reader, yours is to sort morals out for yourself." Yes, indeed, a story like no other. I feel as if I've just resurfaced from falling down a rabbit hole with Alice, Gatsby, Daisy and Wolfshiem, Salinger, J A story like no other! I must PONDER before reviewing. ---- Pondering now complete. Swirling images reined in, thoughts reasonably forthcoming, having dissected through the chaos - somewhat. Yes, indeed, a story like no other. I feel as if I've just resurfaced from falling down a rabbit hole with Alice, Gatsby, Daisy and Wolfshiem, Salinger, Jane Eyre, Faust, Benny and Joon, and the Mad Hatter. An enchanting party, it was. "We all have our own weaknesses, needs, and tragedies, thank you very much . 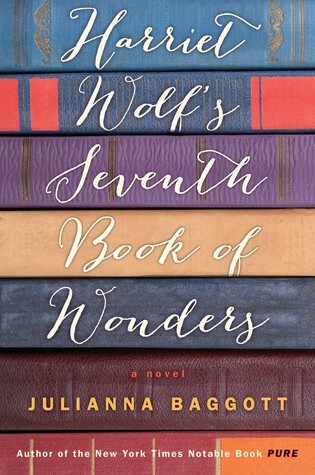 . . "
Julianna Baggott's genre-defying novel - Harriet Wolf's Seventh Book of Wonders: A Novel is maddeningly beautiful, hauntingly mystical, fantastically surreal, chaotically creative, sorrowfully joyful, and inventively genius. Eighteen-years in the birthing! Applause, Julianna Baggott. Such diligence. Such Patience. Such dedication to craft. A true vision for order and beauty in chaos. All made evident in the tenderness and raw honesty within the Wolf family's mental illness tribulations. Illness that tries its best to strangle every relationship it touches. But love, in its many poetic and sometimes volatile forms, blossoms forth like flowering vines that cannot be eradicated. "To fail as a mother is to fail utterly, proof that I don't understand love in its most basic form, that I'm unworthy of the blind and unconditional love granted by simple biology. If I don't deserve this kind of love, what love could I possibly deserve?" A story of mothers and daughters. A story of first love and forever love. A story of sisterhood. A story of mental illness and pain, joy and sorrow, broken wings and knotted strings. A story that creeps in like a flowering vine, taking hold of all your thoughts, captivating, and encapsulating, refusing to be eradicated. "You can't have love without knowing sorrow; you can't have miracles without desperation." Three generations. Four voices - altering chapters. Grandmother Harriett, born dead and deemed unfit, speaks from the beyond. Her books are kaleidoscopes, fictionalized truths, muted mishmash-memories of her fantastical life and her one true love - born in the steam of asylum. "I'm not afraid of dying . . . If you live long enough, you've alread perished a little. Maybe life is a bit-by-bit death." Eleanor, daughter of the dearly departed Harriett, worries-frets-clings-fears-smothers just about everything and everyone. Especially after the "dead fall from the sky." One daughter flew the nest - the other too 'delicate' to leave it. The daughters, Ruth and Tilton: two very unique souls, as different as night and day, though the same as water and rain. One is akin to a typhoon, the other a reflecting pool. All intertwined, all richly imagined - a story that will draw a tear, warm with love, birth a giggle, chill with contempt, irk your ire, and confound all your senses. "[T]he world is beautiful, and ugly too, and sometimes its even beautiful when its ugly." The perfect book club novel. So much to discuss, sort out, celebrate, and dissect. The only negative takeaway, for me: lewdness and expletives; neither were excessive throughout, but the way some of it crept up, shockingly in mid-story, was a bit unsettling. Five Stars for: originality, creative genius, literary radiance, deeply felt characters, courageous topics, and captivating writing. "My mother wore a powder that smelled like a field of flowers! She would wring out a sponge and the water made its way down my back." I have no words. The words have been left in the book. How do I, a simple reader, review this universe of a novel? How do I stand outside and declare, when I perceive myself a mere body of light in context? Truly and really, I can't. Harriet, the sickly baby, removed by the father from the fragile mother at birth. Sent to live in an instit "My mother wore a powder that smelled like a field of flowers! She would wring out a sponge and the water made its way down my back." Harriet, the sickly baby, removed by the father from the fragile mother at birth. Sent to live in an institution, at a time when each wore labels: imbecile, idiot, moron. She meets Eppitt Clapp and as children they bind themselves husband and wife together, a pact wound of string and tape. She learns to read; loses Eppitt and finds him again. Eventually Harriet writes novels which make her famous AND a recluse. "I don't know how everybody walks around just like normal, as if everything is not beautiful and hideous and dangerous." Eleanor, the daughter, ungainly, fatherless. She has just had a heart attack. Raised by Harriet who only understood the skill of abandonment and the art of fiction. Ruth, the truth speaker and searcher, both traits rejected by Eleanor. Ruth left at 16, Eleanor apathetic did not try to get her and has not seen her in twenty years. Ruth is returning, since the heart attack to "save Tilton". They made a pact before she left and has not fulfilled her promise. Tilton , a wisp, a part of a girl not fully in the world, a savant?, uncomprehending, Eleanor's favourite creation made into a palette of allergies, agoraphobia, asthmatic. Housebound and homeschooled, Tilton interprets the few people she knows or meets by comparison to her encyclopedic knowledge and prodigious memory of ornithology. What is this novel, then? It is history of the new century, of Maryland's School for the Feebleminded, of the value of women and children defined solely by a man's word, of normal grief defined as hysteria of the day remedied with institutionalization in psychiatric hospitals, of an African Pygmy displayed in the monkey section on Anthropology at a zoo, of the capriciousness of life made worse without compassion. "My mother died and I didn't take it well. I loved her. ...I kept things before I got here, clippings from newspapers. I want to keep it all. Proof... Proof that lives are being lived." It is about identity. Identity is found in our stories, in our links between people and places, in knowing the truth of what has been carried by those stories and how we learn about building futures from the past of those stories. Those stories are our universe. It is about belonging, and love and all that we hope love could ever become. Who are we without the links, the places, the people and the paper notes between us? "...we were to write letters. I had no one, and so I wrote to Eppitt. ...I folded the letters like origami cranes, the way my mother taught me....I had no address for him, so I ...tucked them into the underside of my mattress..."
"The origami cranes I decided to leave behind so at least some small part of me would remain." Told in alternating voices of the women, Harriet's from a manuscript left behind at her death and the others' weaving threads of missed and lost stitches, bits of wound string written to an exquisite completeness, this gifted author took eighteen years to create this universe of wonder, with its finely wrought nuances of feeling and thought. Mother, daughter, child - all of us will experience this novel singularly and we will also share its profound common threads. Julianna Baggott's novel, Harriet Wolf's Seventh Book of Wonders, cannot be reviewed. It can only be graciously experienced. For me, it’s this kind of intrigue and beautiful use of language that drew me in immediately. Throughout the novel, it became clear the author’s poetry background, as the story is laced with lyrical metaphor and carefully constructed sentences. Writers and readers alike, I think, will enjoy this book about an author who becomes a shut-in and who shares her difficult story from birth to adulthood. Simultaneously, her daughter and two granddaughters tell their stories of shared love and loss and longing – and misunderstanding – as well. Baggott does such a wonderful job of creating unique voices and superb characterization for each female protagonist (We have four narrators – Harriett, her daughter Eleanor, and Eleanor’s daughters Ruth and Tilton). If you enjoy literary fiction about mother-daughter, mother-father relationships (and even enjoy jabs at academia), this is a fine, fine read. I found myself re-reading sentences and really thinking about the nature of parent-child relationships and how realistically the author portrayed those unspoken secrets among family members that lead to conflict, even when love is present. On a side note: I’d have loved to learn more about the author’s research. In her acknowledgements, she alludes only to the fact that she spent many, many years researching (18 years writing). As well, I wanted an Author’s Note about Harriet Wolf. I’m ignorantly unsure if she was real – and/or if this was historical fiction. I surmised she was real, based on the photo at the beginning of the book and by the epigraph from a Wolf book (but thought it might be fictional as well). If she is part of the literary canon, 1) I am embarrassed for not knowing and 2) I wonder how much of the story is based on biographical accuracy and how much is the product of the author’s imagination. That said, not knowing these answers clearly didn’t detract from my enjoyment of the book and, perhaps, added to it. But those types of author notes always satisfy my readerly curiosity. (On another note – I found a blog for the Harriet Wolf Society, which publicly denounced this book… which, to me, is all the more reason to read it! Totally unsure if the blog is legit or a marketing product to add intrigue to the book – but fascinating nonetheless). This novel opens in the voice of Harriet Wolf, providing the reader with the information that she was born in 1900, mute, tiny, and bleeding from the nose. The attending physician told her father that she “wasn’t fit”, so her father asked the Dr to take her away to the Maryland School for the Feeble Minded. Her mother was told that she died. So begins the story of Harriet’s intriguing life. Harriet eventually becomes a popular author who writes the escapades of the fictitious Daisy Brooks and We This novel opens in the voice of Harriet Wolf, providing the reader with the information that she was born in 1900, mute, tiny, and bleeding from the nose. The attending physician told her father that she “wasn’t fit”, so her father asked the Dr to take her away to the Maryland School for the Feeble Minded. Her mother was told that she died. So begins the story of Harriet’s intriguing life. Harriet eventually becomes a popular author who writes the escapades of the fictitious Daisy Brooks and Weldon Fells. She dies after writing six novels, and there are rumors that there is an unpublished seventh novel that her fans are eager to be published. Her life isn’t the only interesting life; the reader learns the stories of Harriet’s daughter, Eleanor, and her granddaughters, Ruth and Tilton. It’s a story of motherhood and sisterhood, misunderstandings, secrets, and coping. Harriet by far has the most fascinating life, which includes a love story and a bit of fantasy. Tilton is the innocent, whose chapters are by far the most fun to read. Eleanor and Ruth are both a bit grating, for good reason. The author, Julianna Baggott uses those characters to show coping mechanisms that can be misunderstood. Baggott writes each character uniquely, with her own voice. I love this devise because the reader gets to understand every character’s intention, even when gone awry. Life is messy and Baggott gives the reader an engaging read as to how messy leads to more mess, even when the individuals are pure hearted. I highly recommend this novel. It would be a great book club read. Harper Lee’s “Go Set a Watchman” isn’t the first “found” manuscript to capture the public’s attention, but has any other literary discovery ever generated such boundless frenzy? You can bet editors and publishers have noticed. That rustling you hear is the sound of scholars rifling through special collections in the world’s libraries while hopeful relatives smash apart antique desks. Hallelujah — here’s Agatha Christie’s dry-cleaning bill! And there’s an ironic Post-it Note from David Foster Wal Harper Lee’s “Go Set a Watchman” isn’t the first “found” manuscript to capture the public’s attention, but has any other literary discovery ever generated such boundless frenzy? You can bet editors and publishers have noticed. That rustling you hear is the sound of scholars rifling through special collections in the world’s libraries while hopeful relatives smash apart antique desks. Hallelujah — here’s Agatha Christie’s dry-cleaning bill! And there’s an ironic Post-it Note from David Foster Wallace! If nothing else, this mania for literary treasures provides the perfect moment for Julianna Baggott’s new novel, “Harriet Wolf’s Seventh Book of Wonders.” In a daring bit of whimsy, Baggott has imagined what it would be like to have written a phenomenally popular series, a collection of novels that everyone has read. . . . It's been a long time since I've read something that I've felt genuinely excited about. I don't know if that's a function of the books I've been reading not being particularly exciting or if it's a function of my life being kind of insane lately. Either way, this was such a fun book, and I thoroughly enjoyed reading it. A full review to come. "Harriet Wolf's Seventh Book of Wonders" by Julianna Baggott, swept me up in the first pages with it's fascinating and unique plot, beautiful prose, accessible structure, and most especially, it's vivid and varied characters. Near the turn of the last century, Harriet was born dead; she tells us this right away. She rallied but her father didn't trust her to remain alive so he told her mother than she was stillborn and sent her to the Maryland School for Feeble Children. Who wouldn't want to kee "Harriet Wolf's Seventh Book of Wonders" by Julianna Baggott, swept me up in the first pages with it's fascinating and unique plot, beautiful prose, accessible structure, and most especially, it's vivid and varied characters. Near the turn of the last century, Harriet was born dead; she tells us this right away. She rallied but her father didn't trust her to remain alive so he told her mother than she was stillborn and sent her to the Maryland School for Feeble Children. Who wouldn't want to keep reading after an introduction like that?! Harriet wrote six novels about the life of a couple, Daisy and Weldon, and became a huge literary success. A seventh novel was to complete the story of Daisy and Weldon...but did Harriet ever write it? (It would be worth millions.) If so, where is it? Here is where the novel gets both fascinating and timely! Harriet is a novelist a la, JD Salinger or Harper Lee, who becomes a recluse with a vast and voracious fan base. Eleanor becomes her "gatekeeper", which is reminiscent of all the recent publicity surrounding Harper Lee's "found" novel and the speculation that it was discovered before her sister (Lee's "gatekeeper") passed away and they were just waiting for that opportunity to publish it. The novel explores the nature of authorship, and what, if anything, a beloved author "owes" his/her readers. (I also thought of "Misery", by Stephen King, which explored the rabid-reader theme in a different way.) Readers do become attached to fictional characters (again the recent Harper Lee debacle), but what responsibility does an author have toward the characters they create and toward the readers? Again, I'm reminded of Kate Atkinson's fabulous novel, "A God in Ruins", which, in part, explores the power of the author to create, manipulate, and destroy characters. This is a novel that MOVES; things happen! There is a pivotal plane crash, a very public heart attack, there is as scathing a description of Literary Academics as I've ever encountered, there are chilling eugenics, Mobsters, motorcycling lions, and there is love. Love, because Harriet tells us that all stories should be about love. Baggott explores with fresh perspective, the nature of parenting, the relationships between mothers and daughters and between sisters, as well as the affects of absent fathers. With skill grace, Baggott beautifully converges the stories of these four women, past and present, to a satisfying, touching, surprising, and wondrous conclusion. IF you think that it is wonderfully special and mystical when your lover insists on describing your love affair as 'bloomed' when he means 'doomed' and 'blessed'...then this book may appeal to you. IF the words that spring to mind when you see a breastfeeding infant are 'rabid piglet'...then this book may appeal to you. IF you think that a series of books will become a world wide sensation when the first book is a children's book, the second is a book about the same children now teenagers in a dys IF you think that it is wonderfully special and mystical when your lover insists on describing your love affair as 'bloomed' when he means 'doomed' and 'blessed'...then this book may appeal to you. IF you think that a series of books will become a world wide sensation when the first book is a children's book, the second is a book about the same children now teenagers in a dystopian society, the third is a romance about the same children now as young adults, published years apart....then this book may appeal to you. IF you think that an infant who is placed in a home for mentally disabled children at birth and raised there without any family contact until the age of 14 will develop into a person who can sustain emotional relationships...then this book may appeal to you. If you wouldn't even raise an eyebrow, or ask any questions, when your new husband says his job is 'hiding things'....then this book may appeal to you. IF you think that Munchausen syndrome by proxy is actually a sign of deep devotion of a mother to a child...then this book may appeal to you. IF you think that it is not despicable for a mother to tell her children a nightly true bedtime story where their family witnesses a plane crash which scatters body parts across a field through which they need to walk, and that ends with the mother saying 'and our family was broken apart never to be whole again'....then this book may appeal to you. IF you are taking your agoraphobic 27 year old sister, who may or may not be autistic, to a restaurant for the first time in her life, and you think it is a good idea to order boiled Maryland crabs that you have to pick apart with your fingers and a mallet, rather than, oh, let's say, a chicken cutlet or some pasta ....then this book may appeal to you. IF you think that when you make a promise to someone, you need to bind your hands together with string until the circulation in your hands cuts off, and then to keep the promise you must keep the string....then this book may appeal to you. I could feel my expectations crumble. I was intrigued by the concept. Reclusive author has one book that was left out of her amazing, classic series. Burdened with this legacy is her only daughter, Eleanor, and through her the author's (Harriet) granddaughters, Ruthie and Tilton. What unfolds is a story of these four women, their family and coming to terms with grandma Harriet. Or so I thought. Despite some of the similarities to 'Go Set a Watchman' this book obviously isn't about that (or the a I could feel my expectations crumble. I was intrigued by the concept. Reclusive author has one book that was left out of her amazing, classic series. Burdened with this legacy is her only daughter, Eleanor, and through her the author's (Harriet) granddaughters, Ruthie and Tilton. What unfolds is a story of these four women, their family and coming to terms with grandma Harriet. Or so I thought. Despite some of the similarities to 'Go Set a Watchman' this book obviously isn't about that (or the author/publisher had a fantastic sense of timing...). The novel alternates between the voices of the four women and telling their stories of love, loss, resentment, maturity and the like. But unfortunately it didn't work for me. Books that alternate views often hit or miss with me. Initially I found the style intriguing and gripping. But as I went along I found it became tedious and I still occasionally had to flip back to see whose POV I was reading. One thing I also couldn't stand was that Harriet's sections were in italics. I understand the device to set her off from the others (she's dead), but my eyes disliked it. After awhile the story got boring. What I thought was going to be about the lost book was really about Harriet's love story, Ruth reconciling with her family, Tilton maturing and Eleanor who has to cope with her two daughters. The constant shift in narratives made me think of a car that stops and goes and fits and spurts--there's no momentum. My interest in the book waned and overall I thought the book really needed a stronger editor. Very rarely do I ever pick up a book that I have never heard of. If you know me, you know I have heard of most new books from one of my bookish friends or another. But I just happned to literally knock this book off the shelf while looking at another. I picked it up, and read the cover and was intrigued. And to be honest, I loved it. The story of 4 women, and how their lives turned into the women that they present to the world. It is a tell that shows you how much we don't really know about thos Very rarely do I ever pick up a book that I have never heard of. If you know me, you know I have heard of most new books from one of my bookish friends or another. But I just happned to literally knock this book off the shelf while looking at another. I picked it up, and read the cover and was intrigued. And to be honest, I loved it. The story of 4 women, and how their lives turned into the women that they present to the world. It is a tell that shows you how much we don't really know about those we love, how easy it is to over protect your children, and how family is always so very important. Not to mention Love as a powerful part of each person's development. What a wonder of a book! As Harriet Wolf, her daughter Eleanor and her two granddaughters Tilton and Ruth each gradually reveal themselves, it became impossible for me to stop reading - I was so caught up in their stories. This will be a fantastic book group choice because of the way that it explores the ties between mothers and sisters, and the power of stories. And the love story is unforgettable! Thank you to Little, Brown and Company and NetGalley for an advance copy of this book. Revealed in wonderful, absorbing layers, Baggott once again forges into new territory in this family drama that crosses generations and consciousness. The voices within the book, of Harriet, her daughter and her granddaughters are individual and strong and the story resonates with images that echo throughout each of these points of view. A lovely read. Baggott writes in four distinct voices in this book: Harriet's, her embittered (but funny) daughter Eleanor, Ruth, Eleanor's daughter who ran away from home at 16, and Tilton, the youngest daughter, whom Eleanor has a Munchausen syndrome by proxy relationship. Each one has their own relationship to Harriet's books: Harriet herself, who transformed a tragic life into novels that succeeded both popularly and academically; Eleanor, whose jealousy of Harriet's fondness for her characters shapes her Baggott writes in four distinct voices in this book: Harriet's, her embittered (but funny) daughter Eleanor, Ruth, Eleanor's daughter who ran away from home at 16, and Tilton, the youngest daughter, whom Eleanor has a Munchausen syndrome by proxy relationship. Each one has their own relationship to Harriet's books: Harriet herself, who transformed a tragic life into novels that succeeded both popularly and academically; Eleanor, whose jealousy of Harriet's fondness for her characters shapes her into the bitter woman she becomes; Ruth, who enters academia and believes her lit professor husband only wants her because of her connection to the possible seventh book; and Tilton, who shares a metaphysical connection with Harriet and whose skewed view of the world is startlingly truthful. This book was amazing, with spiraling depths of psychological problems and makes a person wonder what actually happens in a person's mind. Julianna Baggott has outdone herself on this new and intricate hit book. Read an advanced copy. A lovely story of a multi-generational dysfunctional family, well told. Also a love story. This is an amazing story, well written, great character development. It covers three generations. It shares the lives of Harriet who was born more dead than alive, and I won’t say more, just read it if you like stories about quirky characters and unusual families. This was such an utterly perfect "Christie book". It was told by 4 different women in the same family, one of whom is a famous writer, all of them have different mental and other issues. Everything was very layered, so the more I think about it the more I liked this book. Sooooo good. Very slow with mostly unlovable characters. It took me a long time to finish and it was only redeemed by the last 100 pages. However, I did love this line, "It's like a life is a pact that gets wound from the hands of one generation to the next, but if you don't tell your life, if you don't hand it over, you're cutting the string. The the next generation has no tether. They float off like an astronaut, alone." Okay, that line alone makes me round up to a 3. Harriet, born in the early part of the last century, is weak and her survival is questionable. Worried that his wife become too attached, only to lose her, Harriet's father sends her to the Maryland School for Feeble Children. Labeled a "Moron", Harriet is anything but. In fact she is a genius and later writes a series of novels now considered as classic literature. At the home she falls in love with Eppit Clapp. It is their love story upon which Harriet has loosely based her novels. Having spen Harriet, born in the early part of the last century, is weak and her survival is questionable. Worried that his wife become too attached, only to lose her, Harriet's father sends her to the Maryland School for Feeble Children. Labeled a "Moron", Harriet is anything but. In fact she is a genius and later writes a series of novels now considered as classic literature. At the home she falls in love with Eppit Clapp. It is their love story upon which Harriet has loosely based her novels. Having spent much of her childhood in the Maryland Home for the Feeble, Harriet is not well equipped for motherhood. Harriet raises her daughter, Eleanor as a single mother, disclosing nothing of who her father is to Eleanor. Eleanor too struggles with motherhood. Divorced when her two young daughters, Tilton and Ruth, are quite young, she goes to extremes to protect her fragile daughter, Tilton. But with Ruth, she is different, holding back her love. Ruth runs away at sixteen, rarely connecting with her mother. Yet, between them there are bonds that cannot be broken. Told through the voices of Harriet, Eleanor, Tilton and Ruth, it is a wonderful, quirky story of family. The book is funny, imaginative and wondrous. A famous, reclusive author who has left a body of work that still intrigues readers and a mystery in the form of a resolution to the series she wrote? Ok, tell me more. Turns out, the author (the Harriet Wolf of the title) is dead and the mystery remains. Harriet's daughter Eleanor is an overly protective mother, her granddaughter Tilton is an agorphobic heavily allergic shut-in, and her granddaughter Ruth is just trying to lead a normal life (albeit one married to a leading Harriet Wolf scholar A famous, reclusive author who has left a body of work that still intrigues readers and a mystery in the form of a resolution to the series she wrote? Ok, tell me more. Turns out, the author (the Harriet Wolf of the title) is dead and the mystery remains. Harriet's daughter Eleanor is an overly protective mother, her granddaughter Tilton is an agorphobic heavily allergic shut-in, and her granddaughter Ruth is just trying to lead a normal life (albeit one married to a leading Harriet Wolf scholar). Their lives come back together when Eleanor has a heart attack, and Tilton begins to wonder if now is the time to reveal what everyone is looking for: Harriet's final work. Interspersed with all this is that book, biography rather than the fiction expected. I loved the different characters and their interactions. Was Tilton really as allergy prone as she believes? Why did these women end up the way they did? My only regret was that the original six books are mentioned almost in passing - I wanted more about them. Maybe chunks of them. Why? They sounded so good they deserved more than a few sentences. Famous author and notorious recluse Harriet Wolf is rumored to have a long-lost manuscript, the seventh and final book in her famed series — and if it exists, it just may hold the key to her ultimate confession posthumously. Told from the perspectives of each of the four Wolf women (Harriet, the matriarch of the family, her daughter Eleanor, and her granddaughters Tilton and Ruth) and spanning three generations in narration, this book is astounding -- a heartrending story of love, loss, and rede Famous author and notorious recluse Harriet Wolf is rumored to have a long-lost manuscript, the seventh and final book in her famed series — and if it exists, it just may hold the key to her ultimate confession posthumously. Told from the perspectives of each of the four Wolf women (Harriet, the matriarch of the family, her daughter Eleanor, and her granddaughters Tilton and Ruth) and spanning three generations in narration, this book is astounding -- a heartrending story of love, loss, and redemption and explores the complicated yet sacred nature of mother-daughter relationships. I really enjoyed this one-- and what's better than a book about a book? The writing was lovely, and I've dog-eared so many pages because I loved so many passages. Stick through the first 50 pages-- it'll be worth it! Wow! I really enjoyed this book. I am a sucker for a book about multigenerational families and for a book that is about books and/or writers of books. As an added bonus, the writing is lyrical. I will certainly read other books written by Ms. Julianna Baggott. The book is about three generations of Wolf women and the narration moves back and forth among them. Harriet Wolf is born of a weak mother and her father sends her to the Maryland School for Feeble Minded Children (sadly, a A wonderful book! The book is about three generations of Wolf women and the narration moves back and forth among them. Harriet Wolf is born of a weak mother and her father sends her to the Maryland School for Feeble Minded Children (sadly, a real place) as soon as she is born. Over time, it is discovered that she is a genius. While at the school, she falls in love with Eppitt Clamp, another student and abandoned misfit, and they have a marriage pact. Her father eventually takes her home after her mother discovers that her daughter is alive. There are some happy years, until a tragedy results in her reinstitutionalization. Harriet and Eppitt find each other and have a few blissful years. He is involved with mobsters and this disrupts their life, but not before they have a baby girl named Eleanor. Eleanor has two daughters named Ruth and Tilton. Eleanor has a failed marriage and Ruth has a couple of them. Tilton never leaves home because her mother is convinced that she has a very weak constitution. Eleanor protects Tilton from everything, often by hilarious means. Harriet is a successful novelist with six books and rumors of a seventh. Only one member of the family knows the truth. After Harriet's death, the family is plagued by members of the Harriet Wolf Society, Wolf scholars, and fans. They shun any attention and will give out no information. When Eleanor has a heart attack (while stuck in a window in her house!) Ruth returns home to take care of her sister and honor one of their pacts. Family resentments and conflicts abound. My favorite kind of book, quirky, absorbing, touching, loved every word of it. I really enjoyed this book. I loved that it is set in the East Coast, from where I’m from, and the towns were all familiar. The relationships between mothers and daughters that are explored in this were heartwarming and heartbreaking. This really was a great book. Also writes under the pen names N.E. Bode and Bridget Asher. Critically acclaimed, bestselling author Julianna Baggott is the author of eighteen books, most notably her recent novel PURE, the first in a dystopian trilogy, a New York Times Book Review's Editor's Choice and a People magazine pick for books to read after the Hunger Games, on a list with Orson Scott Card and Philip Pullman. There are over fifty overseas editions of her books. She’s the author of the National Bestseller Girl Talk, The Madam, and The Provence Cure for the Brokenhearted, for adult readers; and The Anybodies Trilogy and The Prince of Fenway Park for younger readers; as well as three collections of poetry, including Lizzie Borden in Love. She co-wrote Which Brings Me to You with Steve Almond, A Best Book of 2006 (Kirkus Reviews), which is optioned by producer Richard Brown and adapted by Keith Bunin with Matthew Warchus set to direct. Her work has appeared in The New York Times, Washington Post, Boston Globe, Best American Poetry, Best Creative Nonfiction, NPR’s Talk of the Nation, All Things Considered, and Here & Now. For two years, her alter-ego, N. E. Bode was a recurring personality on XM Radio. Her work has been a People Magazine pick alongside David Sedaris and Bill Clinton, a Washington Post Book of the Week, a Girl's Life Top Ten, a Booksense selection, and a Starbucks Bookish Reading Club pick.